If you think the Brexit talks have been secretive, you ain't seen nothing yet. If you want to convince the public that trade deals are about rigging the rules of the game for an elite few, shrouding already controversial trade talks in secrecy is precisely the way to do it. In recent years there has been a huge upswing in public understanding that trade deals – or, as many should be described, ‘global corporate agreements’ – threaten progressive social and environmental regulations, the future of public services and even ancient principles like ‘equality before the law’. Yet when it comes to granting the public and parliamentarians a role in forming, scrutinising or even looking in to the content of these deals, it has only gone from bad to worse under this government, especially Secretary of State for International Trade, Liam Fox. One year ago, Fox admitted to and apologised for intentionally side-stepping parliamentary scrutiny to sign the UK up to EU-Canada deal CETA. Only one month ago, a UK trade bill devoid of policies on accountability and scrutiny was published within 24 hours of a public consultation on the trade bill white paper closing – this despite it being responded to by thousands of members of public. Now, Fox has committed to keep the content of ongoing informal trade talks between the USA and UK secret for four years after a deal is struck. As an academic specialising in freedom of information warns, the government has “set the default at secret, and only in a few exceptions will the public get a look”. While Fox says he doesn’t want to repeat TTIP, “where a huge amount of work was done only to find the public won’t accept it”, it is clear that he has utterly failed to learn the lessons of TTIP and CETA. In the space of a few years, these secretly crafted deals went from unfamiliar acronyms to lightning rods for public campaigning – precisely because their dystopian combination of deregulation, privatisation and granting vast new powers for North American corporations to sue the UK and EU governments was all cooked up in utmost secrecy. European parliamentarians keen to vet TTIP texts were met with “a scene from a James Bond film” as they were compelled to hand over electronic devices, sign non-disclosure commitments and stay accompanied at all times. Despite promises, UK MPs were not granted this “privilege” until six months after Brexit when the texts were all but irrelevant for the UK. While the public was reassured with fantastical promises of the deal bringing £400 for every household, bit by bit, leak by leak, the public learned that the dire warnings about the real content of TTIP was true – until the whole house came tumbling down in one mass leak. The issues that were at the heart of TTIP are resurfacing in ongoing talks ahead of a UK-US deal. We’ve already seen Liam Fox defend chlorine chickens, celebrate the “next financial services revolution” that can come about courtesy of deregulating the big banks, and Theresa May refuse to guarantee the safety of the NHS in a US trade deal. However, this time around the UK finds itself in a weaker position, with a government starved of trade expertise, desperate to turn across the Atlantic for a new trading relationship. Donald Trump awaits with arms wide open, safe in his belief that trade is a ‘winner takes all’ game about to be played with a submissive partner ready to accede to his terms. 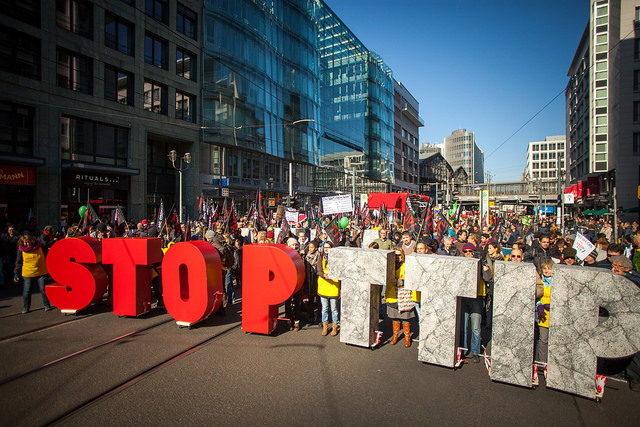 More than half a million British people signed a petition against TTIP and CETA. British people were also the largest contributors to an EU consultation on the roundly opposed investor-state dispute settlement (ISDS) ‘corporate court’ system. As the government’s trade bill passes through Parliament, it will simultaneously negotiate in secret with the Trump trade team. The British public are well aware of the dangers of modern trade deals, and they now rely on the growing number of MPs ready to speak out on trade to protect the fundamentals of British politics and society. Mark Dearn is a senior trade campaigner at War on Want. He tweets here. Yes this Government has truly conned the People of Britain into performing a giant folly by subterfuge and misinformation by newsprint, TV and propaganda into believing in Brexit ! This was never going to be in the interests of us the ordinary citizens but was conceived to be in the interests of billionaires most of whom do not reside in Britain and who pay no British taxes on their wealth! The EU were planning to shut down these Tax Havens and that is the main and only reason Brexit was conceived !